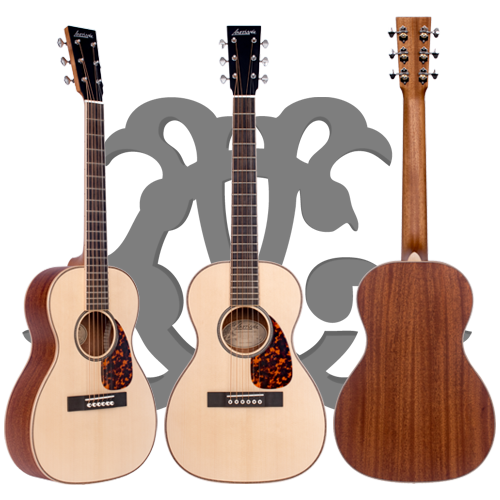 The Willie Watson OM-01 Signature model is now available! Following the success of the Willie Watson OM-01 Reissue Limited Editions, Larrivée is now releasing a limited number of WW Signature models. Left handed models are available. The OM-01's can be found exclusively through WillieWatson.com for $1199 including shipping inside continental USA. The WW OM-01's are built in America, like all Larrivée's, using only the finest all-solid tone woods on the planet. African Khaya back & sides, BC Sitka Spruce top, African Ebony fingerboard, bridge and headstock overlay are among specs. For complete spec click here. Larrivée is proud to release the WW Signature model and as Willie would say, they "ring like silver and shine like gold". IT'S SMALLER THAN A PARLOR! 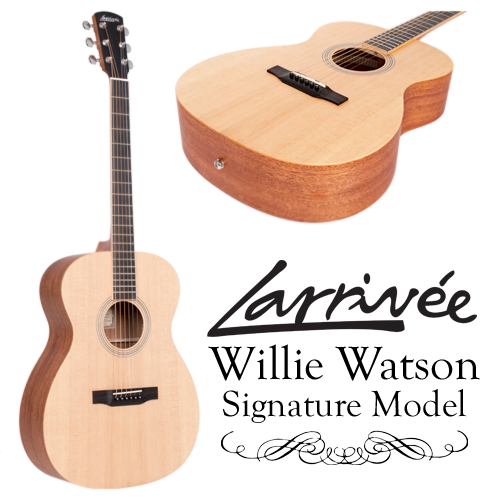 Larrivée has just launched our new and cleverly designed T-40 Mahogany and T-40R Rosewood. This six string tenor size guitar has a slightly smaller body than our Parlor and O-Body, featuring a custom 22.8" scale, full 14 frets to the body and built for standard tuning. There is no decreased body depth which gives this cannon lots of room to breathe. This is a real #tonegenerator that will blow away any other guitar in its size. For complete images and specs, click here. 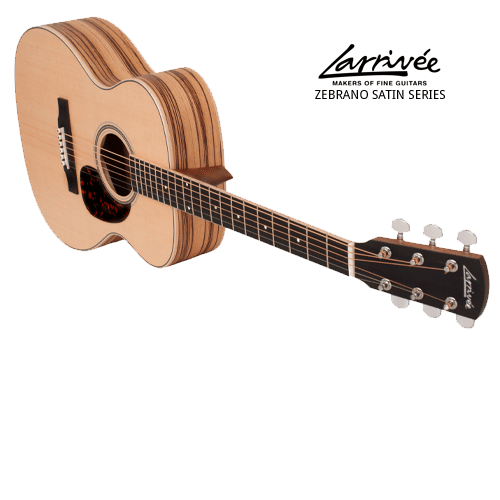 Standard on all Larrivées, T models will feature all solid wood construction, true hand-fit dovetail neck joints for superior fit, finish and tone, and of course, built in America. Tenor models will ship with soft shell travel case and start at $1658 MSRP for Mahogany. Available in all top and back combinations. Contact your dealer for custom order. First run will begin shipping this June. 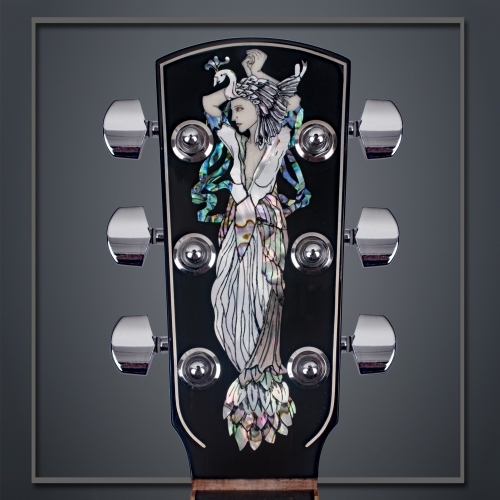 In the late 1970's, Larrivée was one of the first to explore the modern day creation of inlaid works on headstocks. Today, Wendy Larrivée continues to create striking works on a canvas quite different from most artists. Have a look at some of her works both current and archived on our Inlay page. For more information on inlays and how to acquire one, contact info@larrivee.com. The Larrivée Authentic Pro Shop has grown over the years and now has a fantastic selection of many branded items. 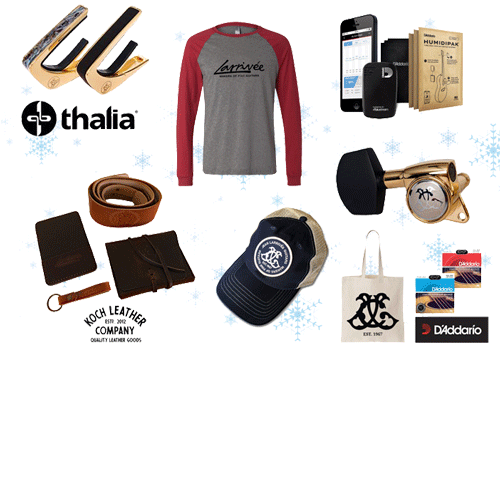 If you are shopping for a friend or family member and not sure what to get, every year we make suggestions and put them in our Gift Ideas section. These are items that any Larrivée player will love. All gift items are returnable after the holidays under our return policy. So no pressure to impress. Coupon Gift Codes are also purchasable in $50 increments simply by contacting info@larrivee.com or by calling our customer service line 805-612-0326. Happy Holidays! We took our legendary 40 Series and finished it with our industry leading pure acrylic urethane high-sheen gloss. Then introduced it at an incredible value and called it a 44. 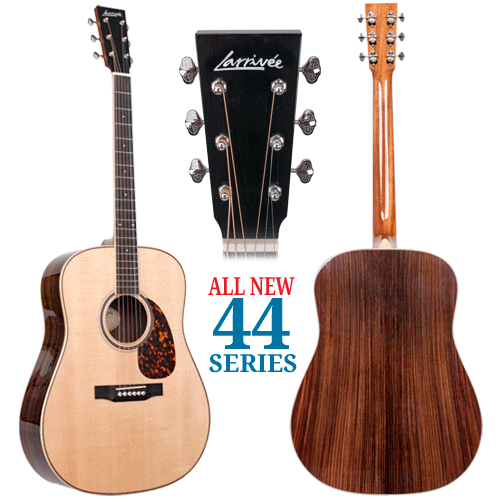 For specs and details please see our D-44R on display in our product section. If you think you loved the 40, wait until you get a 44 in your hands. All new "JCL" Limited Edition Tuner packages are available now! Swap out your older, standard size tuners with these gorgeous 18:1 "JCL" Black Chrome or Polished Gold sets. Each set comes complete with black, machined aluminum buttons that perform as good as they feel. For the detailists out there, included is a matching end-pin for the complete look. Every tuner set and matching end-pin is packaged in a quality collector box that comes with a personally signed declaration. 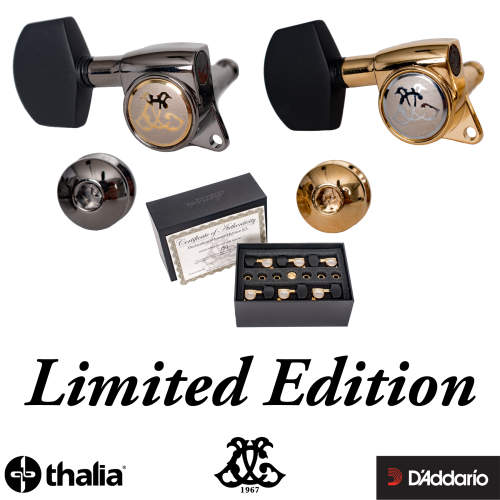 Only 50 sets of each, Black Chrome and Polished Gold, will be released as Limited Edition packages. Both sets are drop-in replacements for any standard size "Larrivée" or "JCL" branded tuners. Both Limited and Deluxe packages are offered. Every package will include a set of D'Addario EXP16 12-53's or EXP17 13-56's and a custom Black on Black "JCL" jersey. Deluxe packages will include a luxurious, matching Thalia Capo with a choice of abalone or ebony trim and a complete Bone Setup Kit with compensated saddle, nut, and bridge pins. All orders will ship the week of Sept 17th. Shipping is included in all orders. DELUXE PACKAGE OFFER IS NOW OVER. Limited sets are still available in BLACK CHROME & POLISHED GOLD. Coming up fast! 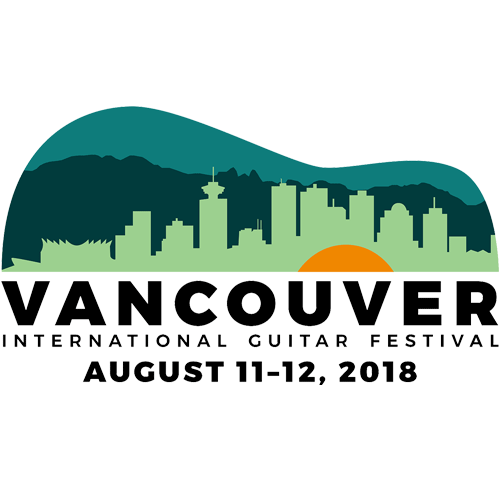 The Vancouver International Guitar Festival is just around the corner. Come see Larrivée and other guitar builders, players, collectors and aficionados for two days of live music, master classes, special events, and the opportunity to see, hear and play some of the world’s finest handmade stringed instruments. This year, the Guitar Festival takes place at the Creekside Community Recreation Centre, located in the former Olympic Village on False Creek, a short walk from downtown Vancouver, near parking and public transit. So if you're in town and looking for something to do, or from out of town looking for a day trip, the VIGF is a great way to spend an interesting day with some cool people and a fascinating craft. Purchase tickets here. A NEW GENERATION OF TONEWOOD IS HERE! Our custom Zebrano Series, also known as Zebra wood, is an exotic tropical species found in Central Africa. The tonality of Zebrano is closer to Indian Rosewood while offering notable mids that are found more frequently in Mahogany. For appearance, we prefer to select our Zebrano chocolatey brown and pale straw in color. Larrivée has completed several limited Zebrano runs over the years, each just as successful as the last. We are currently accepting orders for our next limited run of Zebrano customs due for completion this fall. Contact your Larrivée dealer. Larrivée has once again been chosen by NASA to send guitar to ISS. On February 27th of this year, NASA sent up it's second Larrivée P-01 aboard the Soyuz MS-06 bound for the ISS on Expedition 55. There, it met up with the original P-01 sent on Discovery mission STS-105 in August of 2001. The original Canadian built P-01 has since traveled over 100,000 orbits. That's over 4.2 billion kilometers, or 2.6 billion miles and still going strong. 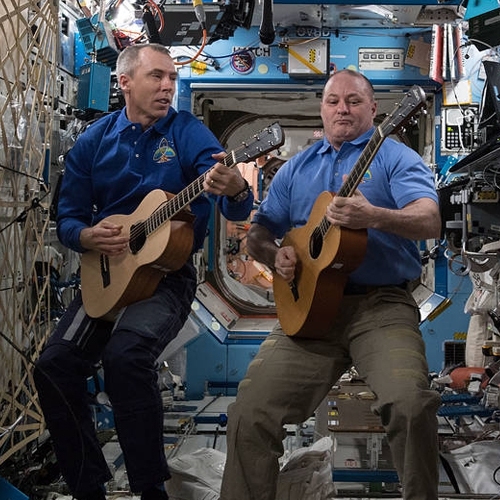 It was the psyche support team at NASA that first introduced the idea to include musical instruments on board the ISS. They realized that music was fundamental to people and thought it would be beneficial to astronauts on the ISS. It was Canadian astronaut Chris Hadfield that made the original Larrivée on board famous when he recorded the first music video made in space. In the above photo, Drew Feustel & Scott Tingle are jamming on both Larrivée's inside the Destiny laboratory module during an educational event with school districts in Aransas Pass, Texas. Rock on boys and girls! On August 10, 2001 NASA Space Shuttle Discovery mission STS-105 reached the International Space Station carrying a special piece of cargo - a Larrivée P-01 Parlor Guitar. Legendary Canadian Astronaut and ISS Commander Chris Hadfield played it frequently while on board and used it to record his version of David Bowie's "Space Oddity" - the first ever music video shot in space, seen by millions around the world. 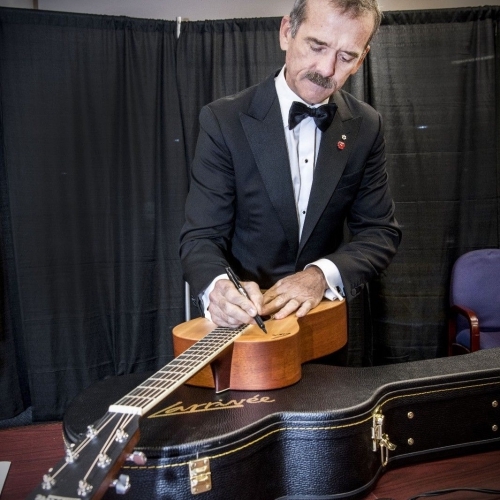 An official limited edition replica of the historic instrument is now being auctioned off on ebay and has been signed by Chris Hadfield specially for the Canadian Warplane Heritage Museum's auction. Have a look at Commander Hadfield's visit to the Larrivée factory back in 2012.